Even when you’re on a giant cruise ship, you may feel the need to get away from it all… get away from the crowds, the pools full of children and the busy bar scene. 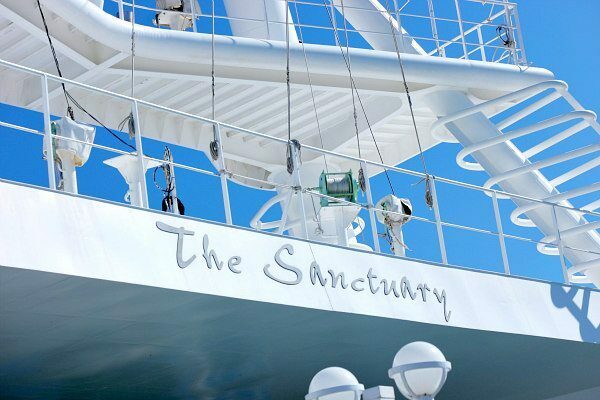 Although there are actually a lot of places on The Ruby Princess to find peace and quiet, The Sanctuary was a special place that I had to check out. 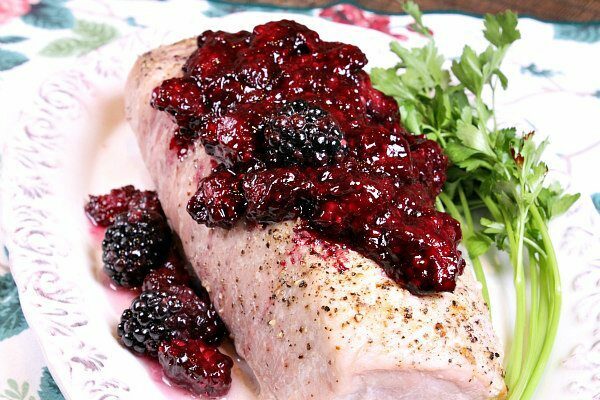 You’ve probably seen this recipe around from time to time. It has been floating around on the internet forever, so the exact origin is probably impossible to nail down. These are nothing genius, they’re nothing gourmet, and they’re not even anything very special. 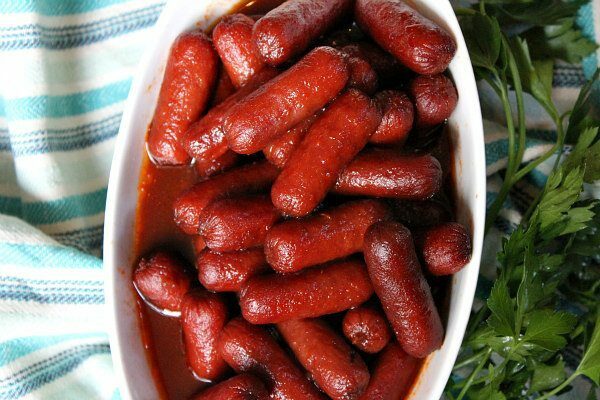 HOWEVER, these are the appetizer on the table that everyone will gobble up immediately! 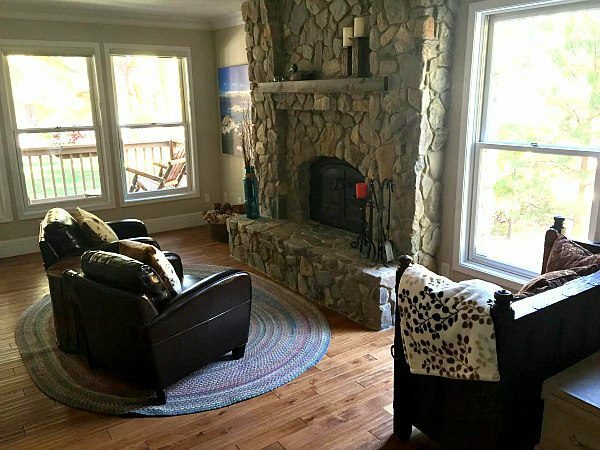 We’ve done a little bit more remodeling in our home since our big Master Bathroom Remodel– this time, we re-surfaced our boring ‘ol fireplace – giving it a Fireplace Remodel. This is the after-picture, so I’m giving you a sneak peek! But if you look at the photos following, you’ll see what a big change this was. 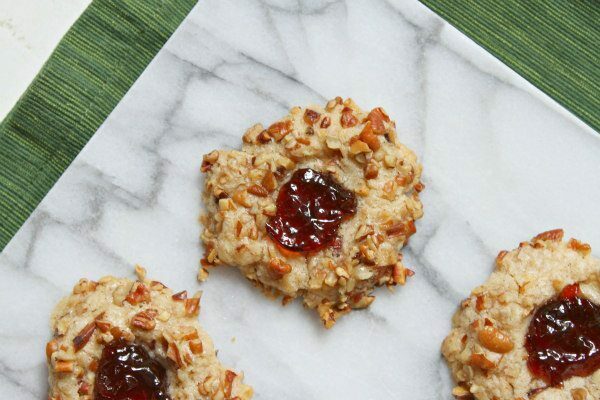 These Red Currant Thumbprint Cookies are pretty on a holiday cookie platter. These goodies are so easy to make that it’s crazy. If you’re not much of a baker, then you’ll be happy with this recipe because it’s NO BAKE. That means you’re much less likely to screw anything up. And if you’re at high altitude and have trouble with baking, you’ll be happy to know that this one won’t get messed up by the altitude either. 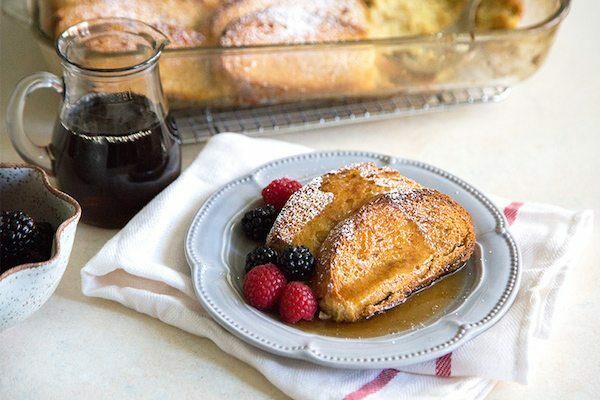 This Eggnog French Toast Casserole will make holiday breakfast a breeze to serve! I normally gravitate towards grab-and-go breakfasts: muffins, scones, croissants. Basically anything I can eat quickly with my morning coffee. Weekend breakfasts are a completely different story. That’s when I crave a hot breakfast, fresh squeezed juice, and free time to lounge around. 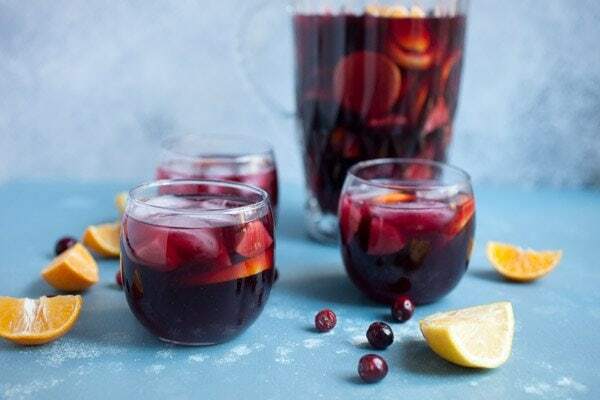 Over the holiday season, have a batch of this delicious and easy Winter Holiday Sangria in the fridge to make entertaining easy! I’m not sure that there’s any better cocktail for entertaining than a good homemade sangria. The best part about it is that it actually gets better the longer it sits (up to a few days) in the fridge. This time of year, when visitors are always popping in and out, I like to keep a good homemade sangria pitcher in my fridge for easy entertaining. Today I’m highlighting a dinner recipe that is quick and easy, and it’s definitely pretty enough for holiday entertaining. 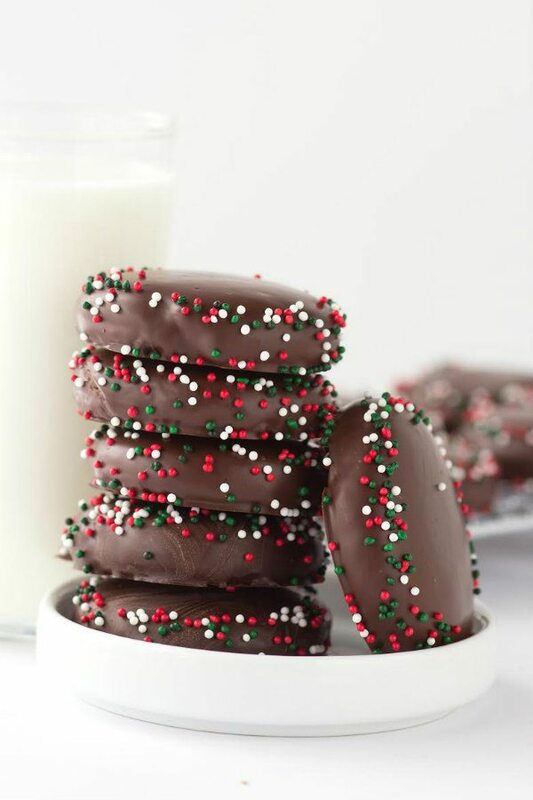 These Chocolate Mint Wafers are the perfect holiday treat! 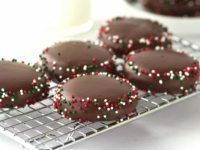 They look so pretty edged with red and green nonpareils, and they would make a fabulous, luxury addition to your holiday cookie platters. These cookies first debuted here on RecipeGirl a few years back. 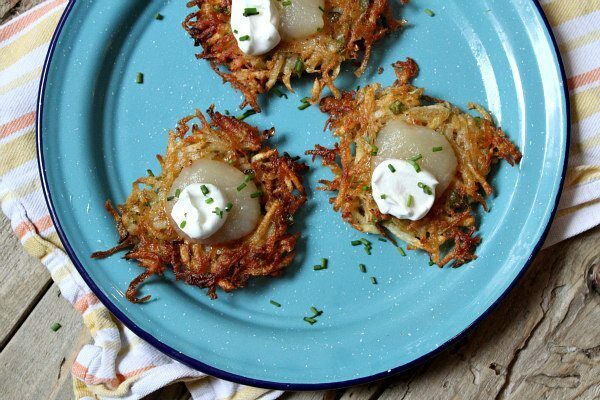 I discovered the recipe in Martha Stewart’s old Everyday Food magazine… remember that one? I loved that tiny book-like magazine for its simple recipes. Anyway, this recipe has always been very much loved. If you’re fond of the Girl Scout thin mint cookies, then you’ll really be happy with these chocolate mint wafers. They’re just like a copycat Girl Scout thin mint cookie! In other words, they’re addicting. You’ll want to eat a bunch of these guys. Of course, if it’s March or August or some other month, you can certainly make these cookies and enjoy them any time of year. They’re awesome! Thanks to Miranda from the CookieDoughAndOvenMitt.com blog for these beautiful photos. Miranda is one of the photographers for RecipeGirl.com, and she captured the deliciousness of these cookies perfectly! 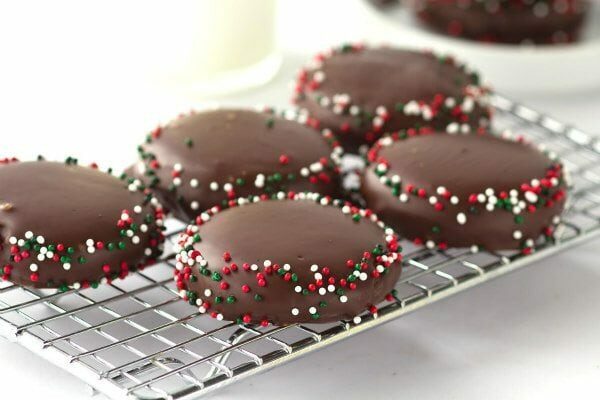 These cookies resemble the Girl Scout Thin Mint Cookies in both appearance and flavor. In a large bowl, use an electric mixer to combine the butter and sugar until light and fluffy. Beat in the egg and vanilla. Gradually mix in the flour mixture and mix just until combined. Scoop out the dough by the teaspoon and form balls; place on prepared baking sheets about 2 inches apart (they won’t spread much). Dip the bottom of a glass in water, and flatten the balls into 1 1/2-inch rounds (about 1/4-inch thick). Bake until slightly firm to the touch, 8 to 10 minutes, rotating sheets halfway through. Immediately transfer cookies to a wire rack to cool completely. Keep parchment on baking sheets. Make the chocolate coating: Place the chocolate, peppermint extract and salt in a glass microwave-proof pyrex bowl or measuring cup. Heat in the microwave in 30 second intervals, stirring every 30 seconds, until chocolate is smooth and hot. Remove from the microwave and set next to parchment lined baking sheets. If you do not have a microwave, you can melt the chocolate in a small pan over very low heat, stirring constantly until melted. Dipping the cookies: Set each cookie across the tines of a fork, dunk in chocolate. Tap the underside of the fork on the side of the bowl to allow excess chocolate to drip off and create a smooth top. 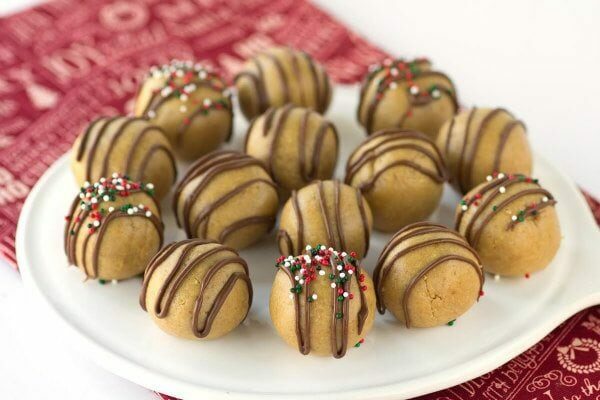 Gently place cookies on baking sheet, and decorate with sprinkles (if desired). Refrigerate until the chocolate has hardened, about 30 minutes, and keep chilled until ready to serve.